Ever since I started using Twitter, Tumblr, and Stikkit, it seems I haven’t been able to finish a blog post. Instead, I’m just Twittering, collecting, reading, posting: generally zipping through the electronic universe leaving a varied trail of my activities and thoughts. This speedy trip has its ups and downs. On the one hand, I know that my various bits will find their way to people through these networks. I’m also capturing most of my output through my data stream/lifestream. On the other hand, my attention is so split by these activities that I can’t find the time to slow down, reflect, analyze, and write a post. Like many of my fellow weblings, I’ve got a drafts folder filled to the brim. What happens to these thoughts as time moves on? Hopefully they resurface in our heads and evolve into full thoughts. If they don’t, we forget and they sit in our drafts queue like an incomplete thought. So today, in honor of my blog’s second anniversary, I tried to do just that. It was harder than I thought. As a stream of consciousness post, all the disparate pieces seemed more like notes from some imaginary conference. So instead, I decided to start a category for “Pico post”, as a kind of hybrid between Twitter and micro-blogging, answering the question “what am I thinking?” I’ve posted various drafts according to their original date. Perhaps this is blog sacrilege, but I’m not really worrying about blog rank or traffic. I just want an semi-accurate reflection of my own thoughts here in this digital archive. These are bits and thoughts that haven’t made their way to a full blog post. Maybe they never will, but at least I’ll remember what I was thinking, and when. Below in reverse chronological order are some of my drafts turned into pico posts. i really like this pico post idea. how did you do it? 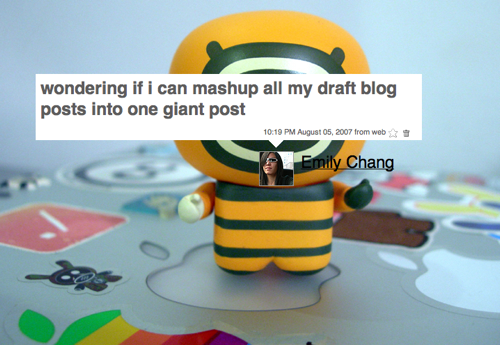 i use blogger and i didn’t know you could have drafts be able to be linked to and commented on? i realize this is probably such a basic question that explaining this to me would probably be like having to explain to someone how to turn a doorknob. but still i ask. Hi. I don’t use blogger but in my system, I just finished writing them and changed the status “draft” to “open/publish” and added them to my pico post category. cool. well i’m going to assume blogger software doesn’t allow pico posting. of course, one could just redirect links within posts to one’s own website, but then again, it wouldn’t have the ability of “commenting” built-in if it wasn’t running the kind of software like blogger or whatever you are using. ordinary websites (like mine) don’t have such software in them. but still, i do like the idea of nesting posting as a way to group similar content threads together in a multilayered format. as beautiful and wonderful as blogging format is, i do find it a little limiting when it comes to old posts being simply lost in the “history/archive” so potential discussions end up not happening whereas they otherwise might have if they were nested as you’ve done here. finally, on the issue of whether pico posting obviates the need for good writing and thought, that is entirely not logical to me. just because you’ve hidden posts within posts doesn’t mean you don’t have to be coherent? surely? the only issue is that you preface the picopost by saying “the following post is kind of a rough draft.” it has nothing to do with the format of the post. only how you present it to your audience. Nabokov talks about this.